A fun and motivating way to get active will be offered on Friday, February 11 during the noon hour. 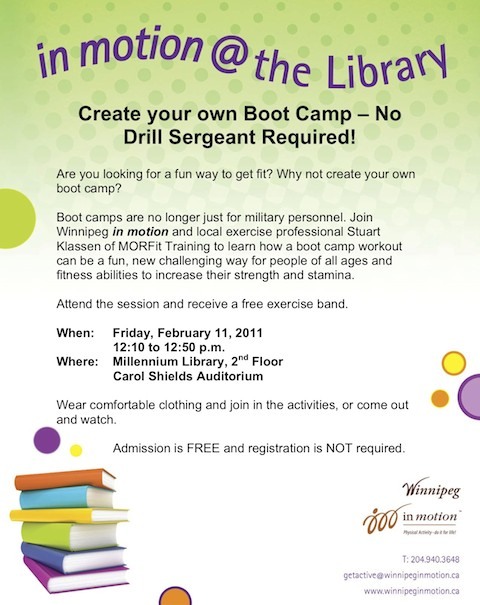 Winnipeg in Motion is presenting a boot camp at the Millennium Library with local exercise professional Stuart Klassen of MORFit Training. The 40-minute session will be a fun, challenging way for people of all ages to get active and increase their strength and stamina. The session will run from 12:10 p.m. to 12:50 p.m. in the Carol Shields Auditorium on the second floor of the library. Registration is not required and the boot camp is free to anyone who wants to attend, or just come watch. If you can’t make it, the information shared during the session will be posted on WinnipeginMotion.ca.